Check out the wackier side of things in The Sims 3 Ambitions Expansion Pack! This game update enables dynamic ad serving capabilities in The Sims 3. However, there are no immediate plans to activate any content of this kind. The Sims 3 EULA has further details. See http://www.ea.com/1/product-eulas. When Mods are placed in the official Mod folder, a notification will appear to remind players that Mods are installed. Placing Mod packages into the Mod folder is an officially sanctioned way to bypass assembly signing verification. The Resource.cfg file must be placed in this folder in order for the modifications to work correctly. When Mods are installed that are incompatible, the player will receive a message notifying them of the error. Story Progression has been improved to prevent Sims required to complete Opportunities from changing. Sim genetics have been improved so that children now better reflect their parents’ skin tone and hairstyles. Sims can unlock outfit choices and share them with household members when using the “Plan Outfit” interaction on the Dresser. When placing walls, rooms, foundations/decks, floor tiles, roofs, pools, fences, and basements the measuring tape tool will display to aid in more precise building. The user-interfaces for Sim View and Map View have been merged to provide more control and consistency between the two modes. The Opportunity interface has been improved to clearly outline the fiction, gameplay objectives, rewards, and Opportunity location for all Opportunities and Adventures. The Sims 3 – The ladies are back! The ladies are back and having more fun than ever before! Chart-topping artists featured in The Sims 3 Ambitions soundtrack! REDWOOD CITY, Calif., May 13, 2010 – It’s time to turn up the volume! The EA Play Label of Electronic Arts Inc. (NASDAQ: ERTS) today announced the chart-topping artists whose Simlish songs will be featured in The Sims™ 3 Ambitions Expansion pack* for the PC and Mac this summer. Artists include Rise Against with their sizzling hit ‘Savior’ which was featured in The Sims 3 Ambitions trailer, new-comer Charice who recently performed for Oprah and Lady Antebellum with their number one hit single ‘Need You Now.’ Additionally, the members of Lady Antebellum were created as Sims for a musical video trailer also being released today. As the second expansion pack to The Sims 3, the best-selling PC game of 2009**, The Sims 3 Ambitions allows players to pursue a variety of exciting paths and careers in their Sims’ lives that in turn affect their overall gameplay experience and neighborhood. In The Sims 3 Ambitions, players can choose to hunt down vengeful spirits as the ghost hunter, invent brilliant and potentially destructive gadgets as an inventor, craft glorious masterpieces as a sculptor, and solve riveting cases by any means necessary as an investigator with dozens of cases to solve and numerous clues to find. For the first time, players will be in charge of how their Sims’ career progresses and decide if they will work for good or evil, pursue creative endeavors or technical affairs, climb to the top quickly, or be a slacker. The future of a Sims’ success or failure is entirely in the hands of the player. The Sims 3 Ambitions Expansion pack for the PC and Mac will ship to retailers worldwide the week of June 1, 2010. The Sims 3 Ambitions will also be available for feature phones, iPhone® and iPod touch® in late 2010 from EA Mobile™. These versions will have customized mobile gameplay features and music playlists which will be revealed in the coming months. For information on carrier availability and pricing for all EA Mobile games, please visit www.eamobile.com. *Requires The Sims 3 for PC/MAC to play. Check out the hit song “Need You Now” by Lady Antebellum sung in Simlish! Video made with The Sims 3. The Sims 3 Create a Pattern Tool is coming Summer 2010! Create and share your own original patterns with The Sims 3 Create a Pattern Tool. Whether you’ve been hankering for a new plaid for your Sims’ PJs or an exquisite flourish of tiles for their floors, everything you want to create is now within your grasp! Design a pattern quickly using dozens of images available in the Sticker Library or layer and modify your own images to create even more unique patterns. Expand your creativity and share your creations online through The Sims 3 Exchange. This summer you can download The Sims 3 Create a Pattern Tool for free at www.TheSims3.com. Stay tuned for specific details and news around the Create a Pattern Tool release. Top creator - fieryfemale shifts her talents between creating unique Sims and building lots that cover various styles. Check out our latest Community Spotlight Interview to see what draws her to The Sims 3's Create A Sim as well as her own trade secrets on building! Pre-Order The Sims 3 Ambitions Expansion Pack! Widen your Sims' horizons with a bunch of killer new career opportunities. Their future is entirely in your hands! 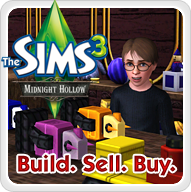 Get FREE items at The Sims 3 Store! From now till the end of May, buy a SimPoint bundle and get a FREE EXCLUSIVE item! Check out The Sims 3 Store to find the latest EXCLUSIVE sets - Sun, Surf & Sand, Championship Dreams, and Faire Folk Outdoors. Be sure to get the FREE Lucky Duckie from the Store and Lucky Duckie Jr. via Shop Mode only! One Week Only - Sun, Surf, & Sand Set Sneak Peak Shop Mode Sale! For ONE WEEK ONLY, the Sun, Surf, & Sand Set is on SALE for only 1,350 SimPoints via Shop Mode in your game! For the ultimate in R&R and tropical living kick back and enjoy the Sun, Surf, & Sand Collection. Access Shop Mode by clicking on the shopping bag icon in your game. Be sure to get this hot NEW Exclusive set during the Sneak Peak Sale before it goes to regular price on May 14th.